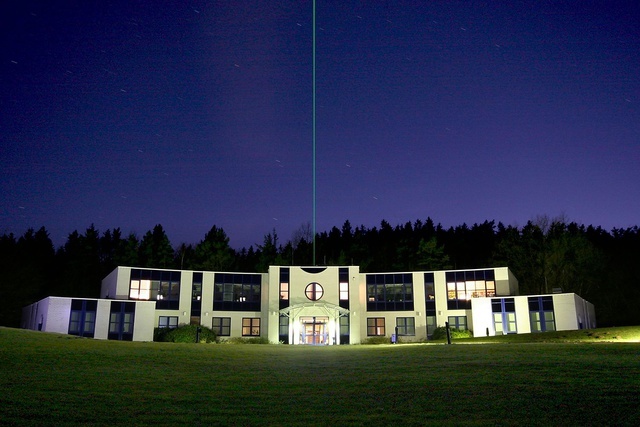 This is a busy week in Sodankylä, Finland, where the International EISCAT Radar School is taking place at the moment. On Thursday morning, all participants got together for the traditional group photo outside the SGO main building. A high-resolution image is available, too. Go RBSP! 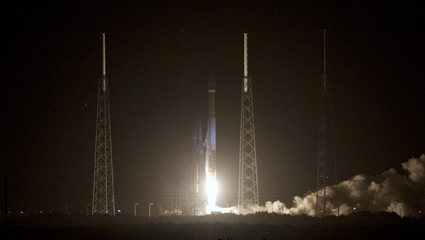 Launch of the NASA Radiation Belt Storm Probes dual spacecraft mission occurred this morning at 4:05 AM EDT from Launch Complex 41 at Kennedy Space Center in Florida, into a highly elliptical orbit designed to continually cycle between the inner and outer radiation belts at an apogee distance of over 5 Earth radii (> 32,000 km) and a perigee altitude of only 600 km. Along with other US geospace radar facilities such as the SuperDARN HF radar network, the Millstone Hill incoherent scatter radar system at MIT Haystack Observatory in eastern Massachusetts will be participating in collaborative science experiments beginning later this fall to study magnetosphere-ionosphere coupling processes and their effects on the ionized and neutral upper atmosphere. As the dual RBSP spacecraft trajectories cross through regions magnetically connected to the subauroral / mid-latitude ionosphere, onboard data on radiation belt electric and magnetic field and energetic particles will be complemented by simultaneous ionospheric measurements from Millstone Hill's wide field MISA steerable antenna and flow velocities from the SuperDARN radar network, allowing studies of the still poorly understood details of magnetosphere-ionosphere coupling. NASA also published the launch video (with sound!). Text: Philip Erickson, photo from the announcement, where there is a larger version available. Image credit: NASA/Jim Grossmann. 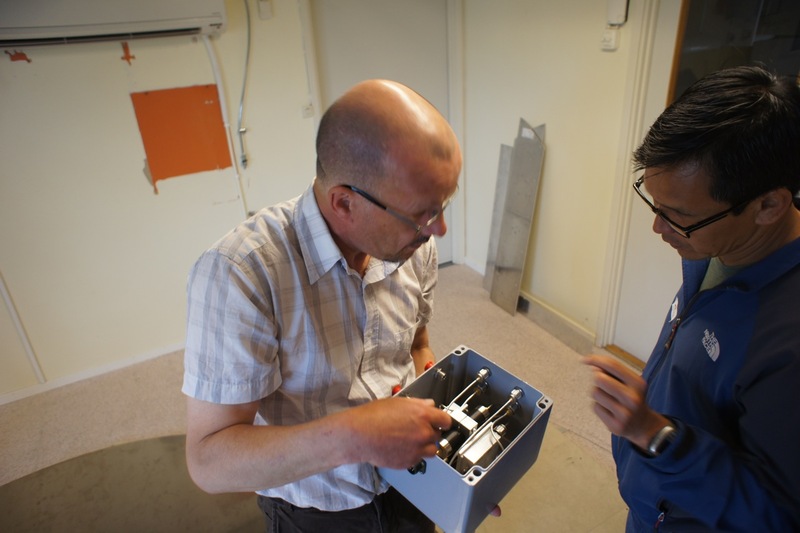 Fantastic news from the Kilpisjärvi Atmospheric Imaging Receiver Array: after first radar light was received last week, bistatic observations have now been made simultaneously along the VHF transmitter beam, which instantly becomes one dimension better than the single point ("common volume") intersection of any UHF remote site with the UHF transmitter. 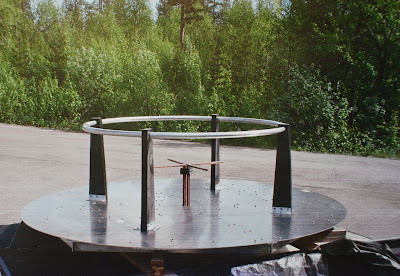 For more details, please refer to the blog post about Lag-Profile Inversion of the Finnish KAIRA Station. 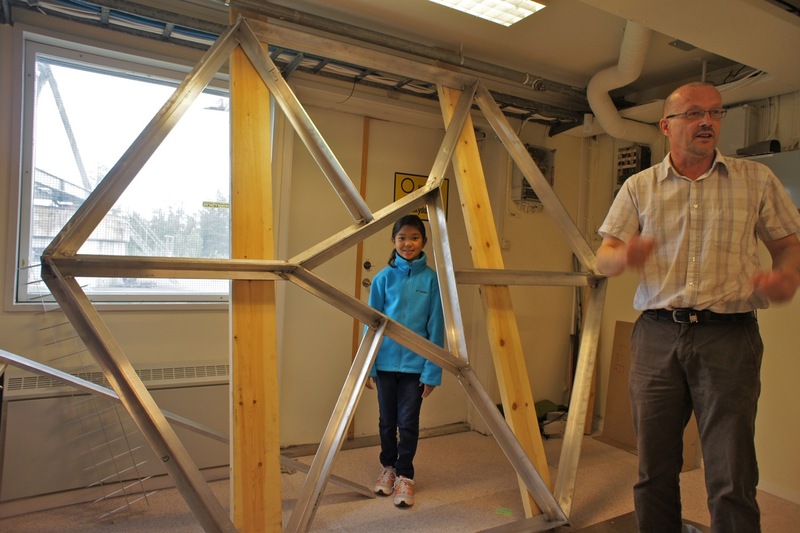 Our colleagues of the Sodankylä Geophysical Observatory (SGO) established KAIRA for EISCAT_3D prototyping work, which is off to a great start after this initial work. Image: Juha Vierinen, Sodankylä, Finland. The International EISCAT Radar School is underway at Sodankylä, Finland. In total, 14 learners and nine instructors are participating very actively and almost around the clock in the activities. Last night, three student radar experiments were run on the Tromsø UHF radar, and the participants will analyse their own radar experiments during the rest of the week in order to present their results on Saturday morning. Besides radar experiments, also other fun activities are taking place during the school. The photo above shows the floating pontoon sauna of Juha Vierinen and Antti Kero, which is harboured on the shore of the observatory. A couple of nights ago, some participants went out onto the river in the late evening in order to have a sauna away from the shore and watch the moon rise above the river. In the process, the record of how many laps someone swam around the sauna in the cold waters of Kitinen (above) was broken several times, and we are proud to announce that Richard Fallows holds the new record of five laps around the pontoon. Well done! 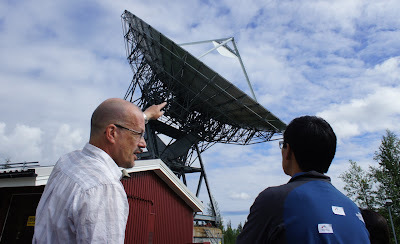 Today the International EISCAT Radar School got underway at the Sodankylä Geophysical Observatory, which is the Finnish EISCAT UHF site. The school brings together 14 students and nine instructors from all over the world including Perú, Brazil, USA, UK, Ukraine, Russia, Norway, Sweden, Finland, France, China. 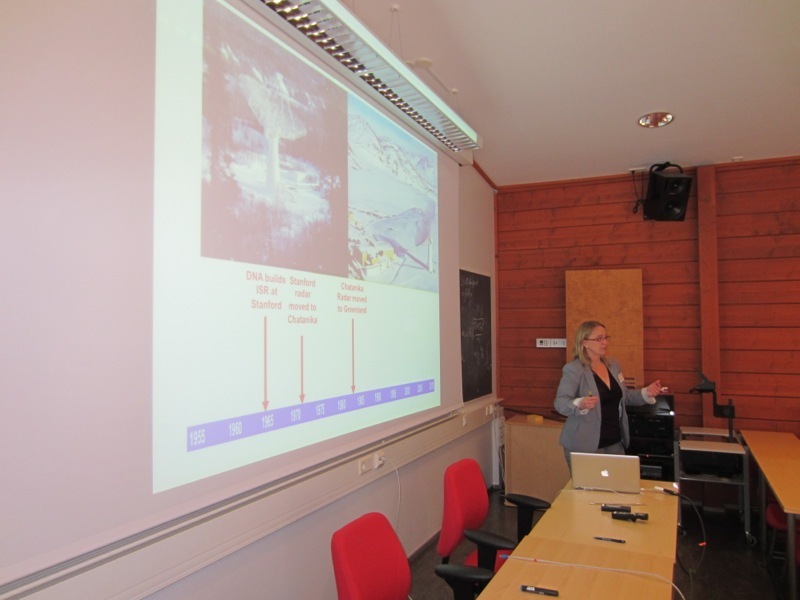 The students are following a lecture by Anja Strømme of the National Science Foundation on the US radar facilities. Please find a programme of the lectures on-line here. During the rest of the afternoon, the students are split into three groups. As groups they will work through some examples of the use of the Madrigal data base, in which most incoherent scatter radar data are stored. Accessing Madrigal is the most efficient way to start using ISR data, and interfaces are available for Matlab, Python and IDL, but full access is possible also through a standard web browser. A comparison of two different techniques for deriving the quiet day curve from SARINET riometer data, by J. Moro, C. M. Denardini, E. Correia, M. A. Abdu, N. J. Schuch, and K. Makita, ANGEO, 2012, Vol.30, pp. 1159-1168, SRef-ID: 1432-0576/angeo/2012-30-1159, http://direct.sref.org/1432-0576/angeo/2012-30-1159. Plasma parameter analysis of the Langmuir decay process via Particle-in-Cell simulations, by M. A. Diaz, M. Zettergren, J. L. Semeter, and M. Oppenheim, ANGEO, 2012, Vol.30, pp. 1169-1183, SRef-ID: 1432-0576/angeo/2012-30-1169, http://direct.sref.org/1432-0576/angeo/2012-30-1169. Underlying mechanisms of transient luminous events: a review, by V. V. Surkov and M. Hayakawa, ANGEO, 2012, Vol.30, pp. 1185-1212, SRef-ID: 1432-0576/angeo/2012-30-1185, http://direct.sref.org/1432-0576/angeo/2012-30-1185. Simulation study of the large-scale modification of the mid-latitude F-layer by HF radio waves with different powers, by G. I. Mingaleva, V. S. Mingalev, and O. V. Mingalev, ANGEO, 2012, Vol.30, pp. 1213-1222, SRef-ID: 1432-0576/angeo/2012-30-1213, http://direct.sref.org/1432-0576/angeo/2012-30-1213. 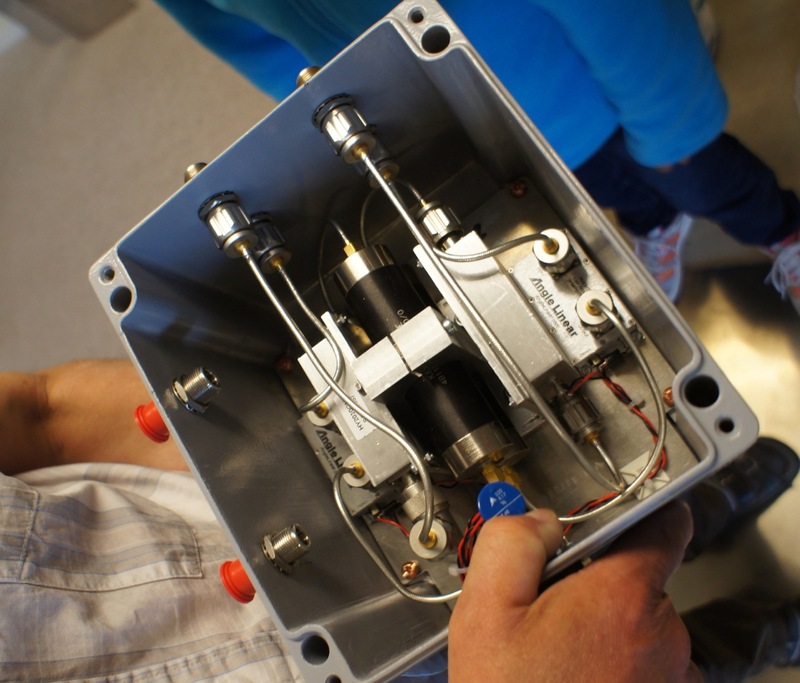 The Leibniz Institute of Atmospheric Physics in Kühlungborn (IAP) and the Rostock University invite applications for the position of a Professor of Experimental Atmospheric Physics. The candidate's research activities should focus on experimental investigations of the Earth’s atmosphere by means of radars and sounding rockets from the ground to the lower thermosphere. He will lead the division 'Radar Soundings and Sounding Rockets' at the IAP and is expected to co-operate with the two other divisions of theoretical and experimental atmospheric research (see www.iap-kborn.de for more details). The candidate should have experience in leading a team of scientists and in applying for research funds. The professorship is assigned to the Faculty of Mathematics and Natural Sciences at the Rostock University. The candidate is expected to take part in the training and lecturing programme of the faculty, including the supervision of post-graduate and doctoral students. Candidates should have an excellent scientific standing and an international reputation in their research field. They should have a professional degree (PhD and habilitation, or equivalent qualification). The position is subject to the conditions of employment of the State of Mecklenburg-Vorpommern (LHG- MV §58 and §61). The salary is according to TVL-MW (salary class 15). Applications of female candidates are encouraged. In case of equal qualification, handicapped candidates are given preference. Applications including a curriculum vitae, a list of publications, reprints of five important publications, documentation on previous research/teaching ex- perience, and a description of future research plans should be submitted by 17th September 2012, to Leibniz Institute of Atmospheric Physics, c/o Professor Dr Franz-Josef Lübken (Email: luebken -at- iap-kborn -dot- de), Schloss-Str. 6, 18225 Kühlungsborn, Germany. Deadline for applications: 17th September 2012. Text: Franz-Josef Lübken; Photo: Gerd Baumgarten, both at IAP Kühlungsborn, Germany. Wave influence on polar mesosphere summer echoes above Wasa: experimental and model studies, by P. Dalin, S. Kirkwood, M. Hervig, M. Mihalikova, D. Mikhaylova, I. Wolf, and A. Osepian, ANGEO, 2012, Vol.30, pp. 1143-1157, SRef-ID: 1432-0576/angeo/2012-30-1143, http://direct.sref.org/1432-0576/angeo/2012-30-1143. Multi-year investigations of aerosols from an island station, Port Blair, in the Bay of Bengal: climatology and source impacts, by S. Naseema Beegum, K. Krishna Moorthy, Mukunda M. Gogoi, S. Suresh Babu, and S. K. Pandey, ANGEO, 2012, Vol.30, pp. 1113-1127, SRef-ID: 1432-0576/angeo/2012-30-1113, http://direct.sref.org/1432-0576/angeo/2012-30-1113. Solar flares as proxy for the young Sun: satellite observed thermosphere response to an X17.2 flare of Earth's upper atmosphere, by S. Krauss, B. Fichtinger, H. Lammer, W. Hausleitner, Yu. N. Kulikov, I. Ribas, V. I. Shematovich, D. Bisikalo, H. I. M. Lichtenegger, T. V. Zaqarashvili, M. L. Khodachenko, and A. Hanslmeier, ANGEO, 2012, Vol.30, pp. 1129-1141, SRef-ID: 1432-0576/angeo/2012-30-1129, http://direct.sref.org/1432-0576/angeo/2012-30-1129. 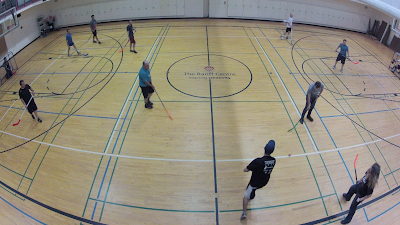 Besides a lot of hard work analysing student radar experiments, which culminated in fantastic presentations on the last day of the Incoherent Scatter Radar (ISR) Summer School, a lot of fun was had including sessions of hockey. 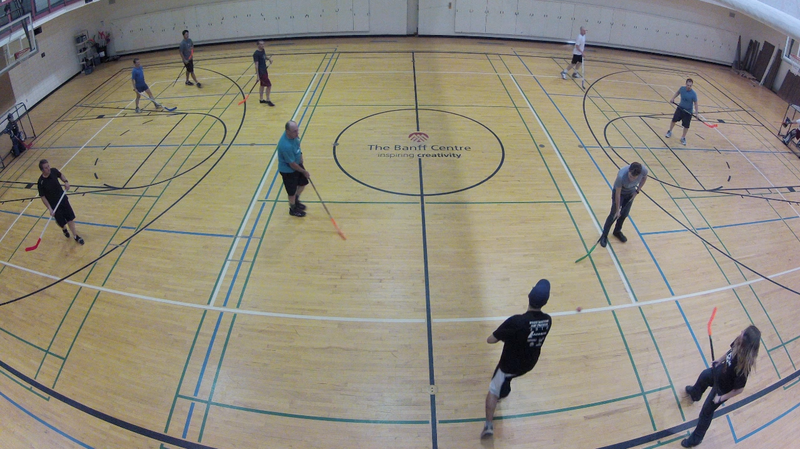 Of course, when scientists play hockey during a radar school, odd components are to be expected. During an earlier part of the school, Phil Erickson demonstrated his homemade radar, a very basic device capable to measure Doppler shift and thus velocity of a target. Of course we had to try and bring the radar to the hockey game to collect some data. 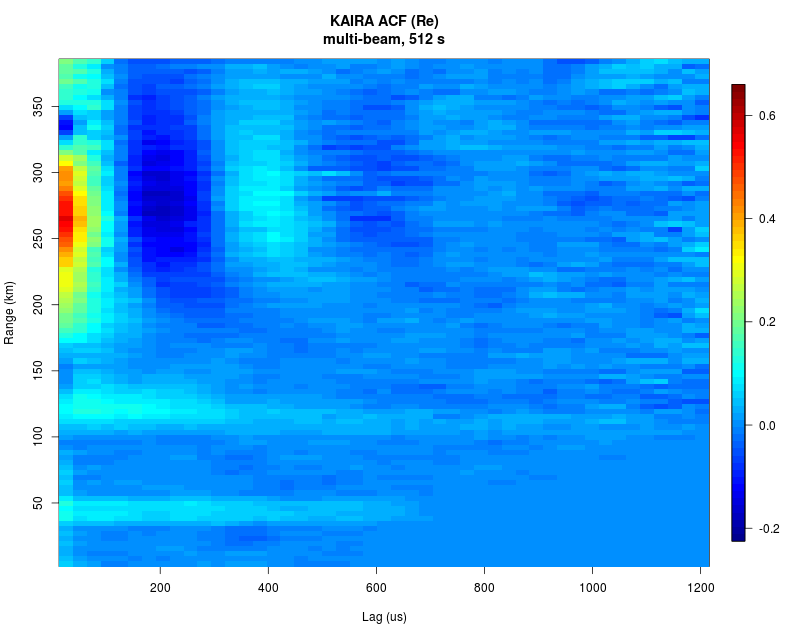 The colour plot above shows one minute of radar data. The colour scale is in m/s. For comparison: 5 m/s equals 18 km/h or 11.2 mph; last night in the London 2012 Olympics, Usain Bolt won gold over 200 m with a time of 19.32 s, which means an average of 10.35 m/s, and even more impressively, David Rudisha broke his own world record over 800 m and won gold with a time of 1:40.91, which averages at 8.93 m/s. 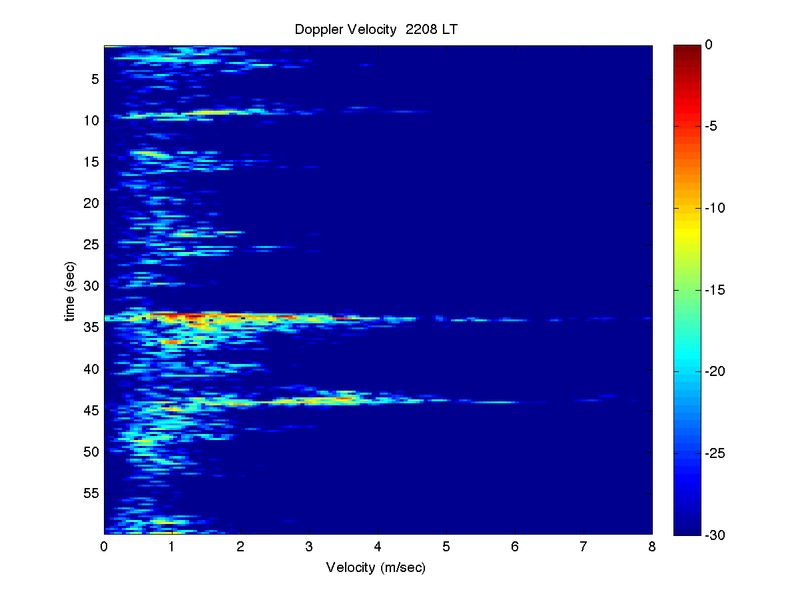 The radar data suggests that some of the scientists moved even faster. This might be due to several reasons: during the hockey game, there wasn't one distinct radar target, but 12 players, many of which would be in the radar beam (or a side lobe) simultaneously. Moreover, the players are waiving their arms and hockey sticks about, creating an amplitude modulation on top of their own speed, a bit like the heavy ion in a cloud of thermal electrons. Also, during the game, the players do run only for very short distances, and thus these very short bursts of high speed may well exceed the speed of sprint athletes, who have to keep up a fast pace for the duration of the race. In addition to the radar, we deployed a time lapse camera, which filmed the hockey game at a rate of two images per second, which was then assembled in a short film running at 25 frames per second. Thus one second in the resulting film equals 12.5 seconds real time. There is a plan of matching the time lapse to the radar data, but this proved tricky due to the accuracy of the clock in the time lapse camera and some other technical problems – lame excuses, we messed it up, because we forgot a synchronising clap at a specific time in front of the camera... You can view a 45-sec section of the much longer time lapse movie here. After the hockey game, we saw this sign on the wall outside the gym, which no-one had noticed before. I guess we broke at least the last rule by bringing a radar and a camera, and we are still wondering what the receptionist might have said had we asked the question of "can we bring a coffee-can radar?" Radar data: Phil Erickson; photos and time lapse: Thomas Ulich. Solar wind plasma interaction with solar probe plus spacecraft, by S. Guillemant, V. Génot, J.-C. Matéo-Vélez, R. Ergun, and P. Louarn, ANGEO, 2012, Vol.30, pp. 1075-1092, SRef-ID: 1432-0576/angeo/2012-30-1075, http://direct.sref.org/1432-0576/angeo/2012-30-1075. Auroral kilometric radiation from a nonstationary thin plasma cavity, by T. M. Burinskaya and J.-L. Rauch, ANGEO, 2012, Vol.30, pp. 1093-1097, SRef-ID: 1432-0576/angeo/2012-30-1093, http://direct.sref.org/1432-0576/angeo/2012-30-1093. Spatio-temporal structure of Alfvén waves excited by a sudden impulse localized on an L-shell, by D. Yu. Klimushkin, P. N. Mager, and K.-H. Glassmeier, ANGEO, 2012, Vol.30, pp. 1099-1106, SRef-ID: 1432-0576/angeo/2012-30-1099, http://direct.sref.org/1432-0576/angeo/2012-30-1099. 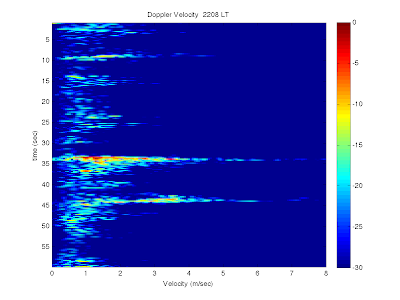 Multifractal analysis of interplanetary magnetic field obtained during CME events, by M. J. A. Bolzan and R. R. Rosa, ANGEO, 2012, Vol.30, pp. 1107-1112, SRef-ID: 1432-0576/angeo/2012-30-1107, http://direct.sref.org/1432-0576/angeo/2012-30-1107. Somehow, at the end of an Incoherent Scatter Radar Summer School, a mountain has to be climbed. Last year, when we had a joint EISCAT-NSF Radar School in Kangerlussuaq, Greenland, near the Sondrestrom radar facility, we took almost the whole course to climb Mt Evans. This time, after the last session on Saturday afternoon, we decided to climb Sulphur Mountain, which is some 700 m above the level of Banff, Canada, where the school took place. Our group hiked up to the peak along a well-made path via countless switchbacks. Instead, one can also take the cable car, but that might turn out more difficult than planned: the queues on the summit for a ride back were endless, and we decided that it'll be quicker to walk back down after enjoying the view and an ice cream. The photo above shows the view away from Banff, on the down a valley of seemingly untouched, endless forest. At the left edge of the photo, the summit station of the cable car can be seen. From the cable car station, one can follow a wooden path to the near-by highest peak. Once there, one finds a small wooden building, which turns out to be a weather station operated by Norman Bethune Sanson between 1903 and 1946. This goes nicely with the memories from Mt Evans, where we found the remains of another meteorological station, which was in operation during the same time. Of interest to space scientists is also the Sulphur Mountain Cosmic Ray Station, which was established for the International Polar Year of 1957–58. Because of its high altitude and proximity to the northern geomagnetic pole, the station was deemed especially suited to monitor "solar cosmic rays," i.e. cosmic-ray type high-energy particles emitted during solar flares. The station was closed in 1978 and the building was dismantled in 1981. Finally, on a brilliantly sunny day like this, the view of Banff was stunning, especially with the backdrop of mountains and forest. Just left from the centre of the image is the centre of Banff, the high street continues across the bridge to the other side of the river. Somewhat to the right from the downtown area, but on the opposite side of the river from where this photo was taken, the conference centre can be seen, which hosted this year's ISR Summer School. Photos: Thomas Ulich; click to enlarge; photos about the measurement stations are taken of information signs on the summit. 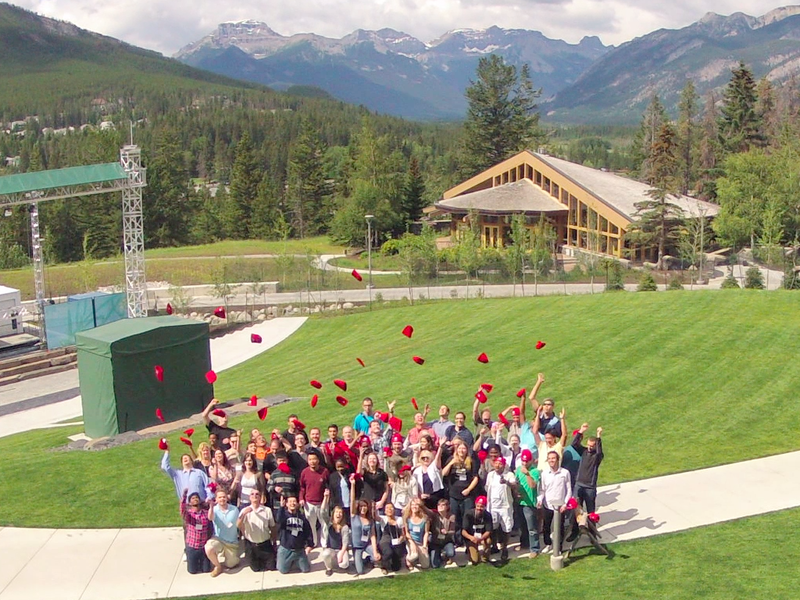 Yesterday, it was time for the group photo of the participants of the Incoherent Scatter Radar (ISR) Summer School in Banff, Canada. While going out in front of the building in which the radar school is taking place, everyone was instructed to bring their ISR Tinfoil Toques, which were distributed at the beginning. Near the end of the brief photo shoot, everyone was asked to throw their toques into the air in a jubilant fashion. The entire event has been filmed with a time lapse camera resulting in a 24-sec movie clip. Another version can be downloaded from the school's web site, which also hosts copies of the lectures. By the way, if you want to read up on earlier posts about this radar school, or indeed on earlier radar schools, we have included a direct link to posts tagged "radar school" in the menu on the right. Photo and time lapse: Thomas Ulich. Last night we witnessed a very cool demonstration by Phil Erickson, who has build himself an imaging radar at a cost of a few 100 USD. Impossible? So we thought. Of course, this is not an incoherent scatter radar, and instead of having the typical 1-2 MW of power, it has only some 15 mW of power, where "M" is separated from "m" by nine orders of magnitude. The radar is based on a course developed by Greg Charvat and Alan Fenn of the MIT Lincoln Laboratory, and the course materials and instructions are online at the MIT OpenCourseWare site. Here's a close-up of the radar as build by Phil Erickson, who works at the MIT Haystack Observatory at Millstone Hill, near Boston, USA. The most prominent parts are the "cantennae," which one can obtain by drinking lots of coffee – which is easily achieved among space scientists, or then maybe in some radar facility's control room in the middle of the night... Some electronics connected to these coffee cans makes a radar, which can be powered by eight AA batteries (two black cases) and which runs at 2.4 GHz, which is a band reserved for, e.g., wireless LAN etc, which means that anyone can use it. With the help of a basic oscilloscope, the participants are looking at the signal at different points of transmitter and receiver. 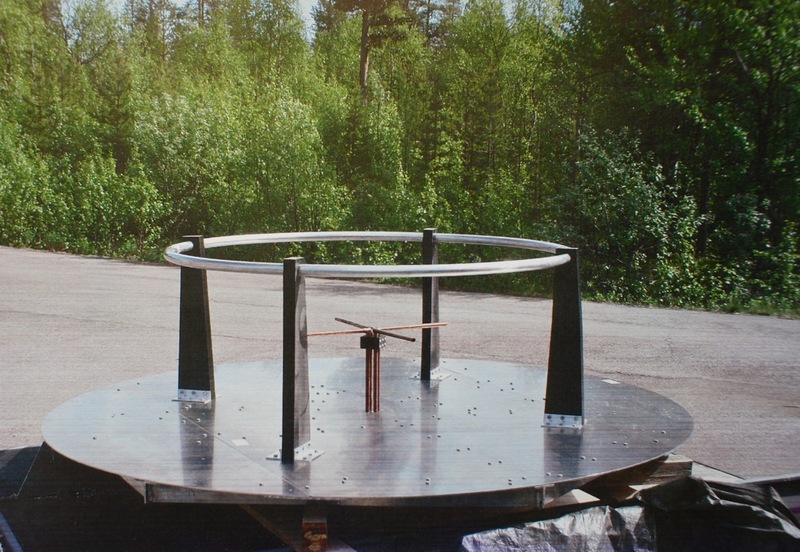 This fully analogue radar can be sampled by simply connecting it to the audio input of a computer and sampling at the standard 44.1 kHz rate of typical sound cards. These data are stored in WAV files, which can then be read into your favourite data analysis software and plotted to give a target's location, speed or even structure. In order to test the setup, some of the participants were asked to run towards the running radar at different speeds, one after the other. Thereafter the data was run through a fairly simple computer program after which the guessing game started: who was fastest? Which trace belongs to which person? A lot of fun for everyone! Photos: Thomas Ulich; click to enlarge. 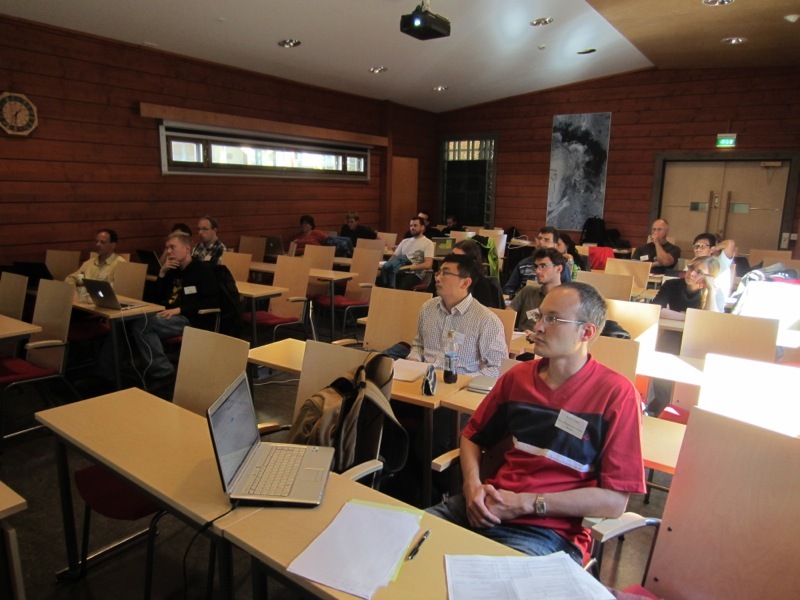 Today is the third day of the Incoherent Scatter Radar (ISR) Summer School here at Banff, Canada. It's an exciting day – for two reasons: first, this morning the group left the conference centre for the excursion, and a 40-min coach trip later we visited Johnston Canyon, a popular scenic spot in the national park with two water falls, which can be accessed along a well-built path of some 2.7 km. Some wildlife was seen along the trail despite the many visitors. We saw several of these chipmonks, which seem to have grown accustomed to humans. With the right technique, one can succeed taking brilliant pictures in difficult conditions. Here Craig Heinselman, who will head EISCAT from next year, is shielding the sunlight from reflecting inside the lense. The "Upper Fall," a water fall of some 30 metre drop in a very narrow canyon. An impressive sight. Can you imagine anyone taking a kajak down this fall? No? Check this out. The first part of the trail ended above the Upper Fall where the photo was taken. From left: Craig Heinselman, Bill Rideout, Phil Erickson and Jean-Pierre St-Maurice, three of them proudly sporting their ISR Tinfoil Toques, otherwise known as red woolly hats. Photos: Thomas Ulich; click to get larger versions.